So very much to do, but I am loving it. Having time off this month to focus on planning and preparation is becoming more and more important. My days are full. My daughter, Haley, and I are going to pick up my Shasta kayak tomorrow, December 16. The boat and all the gear that came with the deal (thanks again, Bob!) is being stored at Michael Clark’s Big Muddy Adventures headquarters in St. Louis. Merry Christmas to me (payment day is so far removed in the past that they will seem like gifts :))! Thanks again Michael for storing the boat for me. Also, Haley confirmed with me yesterday that she will help with my shuttle. She will accompany me to Montana, and hang out with me until I get started. Then, drive my car back home. (The bandage on my hand was from last year this time. I had carpal tunnel surgery on both my hands. They are great now.) We’ll definitely stay at Norm Miller’s Base Camp International in Livingston, MT, while I try and assess whether a source start is feasible. This road trip will be the first time we have been out of the state together, or on any type of significant trip, ever. I cannot wait! 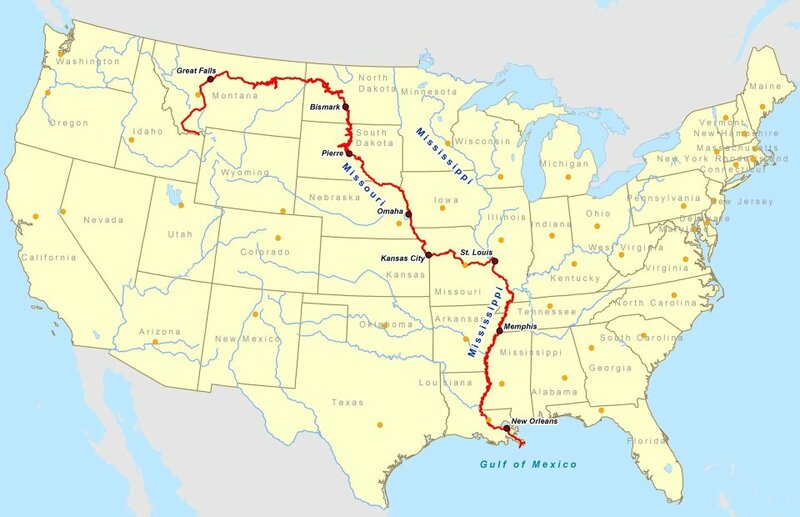 Rod Wellington, who will be paddling through Cooper’s Landing this Monday and Tuesday, will help me get a better idea of what the 300 mile stretch from Brower’s Spring to Three Forks is like. He is encouraging me to start at the source: “Janet, I wholly encourage you to start at the source. The 298 river miles above Three Forks was my favourite part of the river. it cannot be topped. ” I have wanted to start at the source since I decided to do this trip. However, April will offer up additional challenges. Brower’s Spring drainage heads off to the upper right of this photo (by Norm Miller). This photo was taken in June. I will have to start in mid-April. Not sure if it will be possible, despite my ski-mountaineering background. Hell Roaring Creek below heads downhill from the spring and, obviously, will not be a paddling stretch. Seven miles hiking in and seven out. Something to seriously consider. I added a Pay Pal button on this blog (Make a Donation Page). Financial support is not the only “support” I need, but it is an important one. Haley and I met with Tina Casagrand yesterday to discuss Kickstarter, an online video fundraising program. She shared a lot of valuable information with us in this regard. I have asked Jim Karpowicz, friend, river rat, founder of Missouri River Relief, and creative documentary filmmaker, if he can help me produce a video. He is willing to help so I hope to meet with him to discuss further. I also met with the co-founder of Missouri River Relief, Charlotte Overby, who is now River Coordinator at Conservation Lands Foundation (CLF), and beloved by our entire river rat community. CLF works with and supports groups and non-profits who advocate for wilderness lands managed by Bureau of Land Management (condensed explanation). CLF supports Friends of the Missouri Breaks Monument. We are floating ideas around. I created a Facebook Page, LoveYourBigMuddy Expedition, so please “like” it. Part of expedition planning is sponsorship proposals. Companies like to see lots of exposure potential in their sponsorees. Social media is a big component of the total experience. Being as this is my first endeavor, it is likely sponsorship will be light, if not none. But, one never knows for sure, right? If you are reading this and have not yet “liked” my FB page, I implore you to do so. Rod Wellington is due to arrive at Cooper’s Landing Monday and stay over a couple of nights. He started at the source in June, and is paddling to the Gulf of Mexico. He is paddling the seven longest rivers in seven continents, all self-powered. We will take good care of Rod at Cooper’s, as we do all of the river folk paddling through. He can stay for free, take a shower, do his laundry, drink beer, play games, eat a home-cooked meal, run into town, and watch wide-screen surround sound sports/TV/movies. Monday night is game night at Cooper’s. Yes, like games: SkipBo, Monopoly, Cribbage, darts, etc. May be a bit of culture shock. Although, he’ll be hanging out with river folk family. We’ll warm him up before sending him back out on the river. Robin and Connie Kalthoff in Waverly set a high bar for taking care of paddlers. They are about 3 or 4 days upriver, and one of the stops for paddlers on the way; a hard act to follow. Here they are just yesterday, Friday. Rod and I will be discussing the 300 miles between the source and Three Forks quite a bit. Zero Emissions Expeditions passionately promotes the practice of low impact, long distance, self-powered exploration. Oh, one other thing happened last week. I spoke with my Social Studies methods professor when he was writing up a teaching letter of recommendation for me. I directed him to the MizzouWire story, which had just posted a couple days earlier. Then I brought him to my blog site, and he loved all of it, especially the book, “Our Mississippi.” He asked me to contact him after break and said he would help me with a book. We’ll see. I love it when things just fall into place.